If you fly into Atlanta, you’ll be touching down at the busiest airport in the world: Hartsfield–Jackson Atlanta International Airport (“Hartsfield,” “ATL,” or just “the airport” to locals). It’s a major hub for Delta Air Lines, AirTran Airways and now Southwest Airlines, so check those airlines for good deals on fares. The airport is located about 14 miles south of the Midtown neighborhood, but a taxi can get you there for a flat rate of $32, plus $2 per additional person. For a cheaper ride hop on MARTA, Atlanta’s public rail. There’s a rail station in the airport with a direct line to the Midtown station. 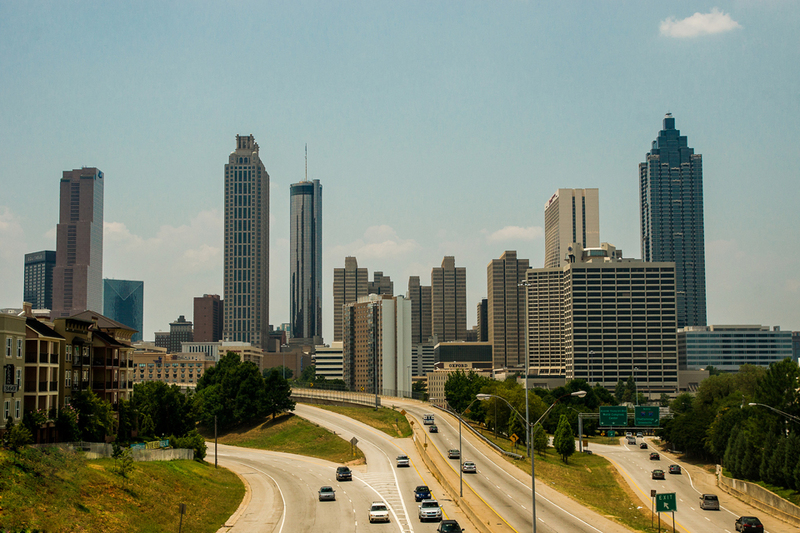 Atlanta is easy to get to by highway traveling on I-75 (serving traffic from Detroit to Florida), I-85 (connecting the Mid-Atlantic to New Orleans) or I-20 (connecting Texas to South Carolina), all of which cross through Downtown Atlanta. Depending on your ETA, you’ll want to keep an eye on Metro Atlanta traffic; Friday Rush “Hour” settles in around lunchtime and doesn’t end until 7 PM. The brewery is in a neighborhood called West Midtown, but the closest hotels are located on the other side of the highway in Midtown proper. The Meet & Greet’s in the heart of midtown, and the Midtown neighborhood is central to the city and a quick trip from the most popular Atlanta-area attractions. There’s plenty of places to stay in the Midtown area, but we’ve set aside blocks of rooms at two hotels close to restaurants, shopping and public transportation (both hotels are walking distance to the Midtown MARTA station). Check out all the details on the Accommodations page. Midtown Atlanta is a very walkable neighborhood and you could probably get away without anything but your feet for the weekend. There’s plenty of sights, shops and eats to keep you busy on and around Peachtree Street. Let us know if you need any recommendations. It’s possible to flag taxicabs down near tourist attractions and bars in Midtown and Downtown. But calling ahead is the best way to get a ride. An alternative to traditional taxis (we use it all the time! ), Uber is an on-demand car service that operates through a mobile app. Sign up for an account here, then use the app to get a fare estimate, order a car, share your location and watch on a map as your car arrives. At the end of your ride, the complete fare (including a tip) is charged to your credit card, no cash needed. Enter promo code om9yo when you sign up to get a $10 credit towards your first ride. Many of Atlanta’s biggest attractions are accessible via the MARTA rail system. The Midtown rail station is located directly next to the Regency Suites hotel, and two blocks from the Hilton Garden Inn. A one-way fare is $2.50 with cash or card at the station kiosk (unlimited rides start at $9/day), but you’ll need to pay an extra $1 with your first fare for a reloadable Breeze card. We want you to enjoy your time in our adopted hometown of Atlanta, so if you want any recommendations for fun things to do or places to grab a bite to eat, just ask! You can also check out (shameless plug) the Design Lover’s Guide to Atlanta Taryn wrote for Apartment Therapy. October is beautiful in Atlanta! The high temperature is typically around 75° in early October, with daily lows in the mid-50’s. It’s also one of the dryest months of the year here, so we’re hoping for sunny skies all weekend.